Somewhere between Massachusetts and California, between the Mississippi Delta and Chicago, between the blues and rock & roll, between soul and jazz sits Taj Mahal. 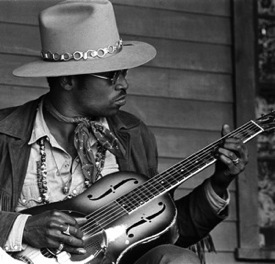 Simultaneously recognized and yet rarely heard, without radio aid or a bevy of co-genre players to be compared to, the man has a career that spans from sharing his first band with Ry Cooder, to friend of, and influence upon, the Rolling Stones (not to mention three Grammy’s under his belt). Mahal’s rise to notoriety began early, and is intricately, and oddly, tied to the aforementioned Rolling Stones during their transition from Brit-invasion rockers to hippies and hipsters. Mahal, suffice to say, blew the roof off of the Rolling Stones Rock ‘n’ Roll Circus. His performance, at the taped concert-event (that was never aired), easily competes against The Who’s “A Quick One While He’s Away” for the show’s highlight. Two weeks after this seminal performance, Mahal released his second solo record (and the first predominately written by him): The Natch’l Blues. A preview and blueprint of his coming career, The Natch’l Blues is a record that straddles up-tempo blues, Otis Redding-esque belted ballads and gut-bucket rock. With a band that included members Al Kooper on piano (who infamously played with Dylan when he went electric), the vastly underrated guitarist Jesse Ed Davis and drummer Earl Palmer (himself a member of the Rock ‘n’ Roll Hall of Fame). One of my favorite albums of all time. Love his harmonica playing and everything else he does. Jesse Ed Davis is a demon on guitar. This record absolutely radiates. His first, self titled one and Giant Steps are also great, but this one is the one I always reach for when I need a dose of Taj. “Jesse Ed Davis is a demon on guitar.” Well put. Most underrated guitarist of that era IMHO. Taj is a living legend. The Cuckoo has seen a lot of play from me over the years. Always a crowd-pleaser. Well used by DJ Premier of Gang Starr, too. I have to admit, I’m am new to Taj Mahal. Corrinna has such a feel that just speaks to me. Thanks for the great post. Great post there, Kramer. It’s nice to see some Taj love. I knew the guy for awhile, as my dad kicked around one of his records (don’t remember which) for awhile when I was in middle school or high school. But I didn’t really have any sort of relationship with his tunes until someone left Hanapepe Dream in my car around ’03-’04. That’s, admittedly, a weird starting off point for the guy given its Caribbean lilt, but it did have a few staples on it (Stagger Lee, among others I can’t remember offhand), and it prompted to buy like five of his records in the next month. Also, as an aside, the Dirty Mac “Yer Blues” rendition is, for me, a favorite of the Rolling Stones Rock and Roll Circus, mostly because what if Eric Clapton, Keith Richards, Mitch Mitchell and, ahem, John Lennon had actually recorded a record together? That’s what the Dirty Mac makes me imagine. jesselun, you are correct, an accident of my own editing – I believe I got a little trigger happy with the Cut and Paste. Thanks for the heads up! Great to see Taj getting some blogpress. One of my favorite artists of all time. A rather big guy, quite amazing to see how his huge hands can cover the fret board. If he plays in your area, go see him, he is talented on piano, guitar, harmonica etc. His album 10 years back with east african musicians is also top-notch, though not too bluesy. I understand Taj has also worked here in NC to raise money for the non-commercial Appalachian bluesman community.